The Open Sands region of Panama City Beach is centrally located, making it a convenient starting point for planning your trip. From here, you can easily access award-winning restaurants, thrilling attractions and, of course, the beach. No matter where you stay in the Open Sands area, it’s sure to have a breathtaking view. At the Holiday Inn Express & Suites, you can take in the gulf view while you have dinner at the hotel’s outdoor Indigo Bar & Grill. The poolside eatery is flanked by two pools in a spacious patio area that also includes a lazy river and live pop-up entertainment acts. One of the newer accommodations in the area, the hotel features modern décor and complimentary hot breakfast. Panama City Beach is full of high-rise accommodations, but if you prefer cozier lodging, you can find that too. Beachbreak by the Sea is a four-story hotel where you don’t have to worry about remembering which tower you’re staying in. However, it still has some of the appealing amenities of a larger condo hub, like on-site guest laundry facilities and kitchen or kitchenettes in each room. There’s also an outdoor playground for kids and the adjoining Barefoot Hideaway Grill where you can get drinks and food to take back to your room, enjoy by the pool or savor on the patio. When you’re ready to explore, you won’t have to go far to find something interesting. Across the way from Beachbreak by the Sea is Gulf World Marine Park where visitors can safely get hands-on with all types of sea creatures. If swimming with dolphins has always been your dream, you can do it here. More of a stingray fan? You can interact with them too. There’s also a seal encounter, entertaining educational shows, and exhibits with penguins, flamingos, sharks and sea turtles. For indoor fun where the kids can quite literally bounce off the walls, head to Just Jump Trampoline Park. While the 30,000-square-foot facility has a Kiddie Area dedicated to children under 6, Just Jump is fun for visitors of all ages. A ninja obstacle course, spring-loaded basketball and dodgeball courts, open jump area and gladiator pit ensures there’s something for everyone. At Shipwreck Island Waterpark you can play in the water all day with the added fun of thrilling slides and controlled waves. 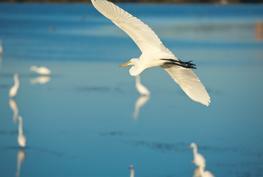 The 20-acre park is extremely family-friendly with several attractions dedicated to little ones. Adults and big kids will have their fun with the 500,000-gallon wave pool producing 3-foot waves every 10 minutes, multiple slides up to 65 feet tall, a Lazy River and faster White Knuckle River and a zip line that ends with you jumping into the water. While you’re near the water park, consider ending or beginning your day at the M.B. Miller County Pier. 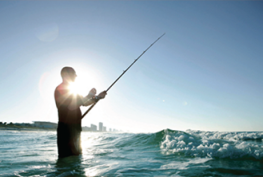 The pier stretches 1,500 feet into the Gulf of Mexico and is an ideal spot to go fishing or catch a sunset or sunrise. Satisfy the hunger you’ve worked up exploring all day with lunch or dinner at any of the fabulous options in the Open Sands neighborhood. Wicked Wheel Bar and Grill serves southern comfort foods and is a themed after classic cars and custom motorcycles, making it a meal you won’t soon forget. Make sure you stop by the bar for a photo with the motorcycle barstools or souped-up hot rod being driven by a skeleton. Go all out for your splurge meal in Panama City Beach at Firefly. The fine dining establishment provides casual elegance and a chef-driven menu for discerning palates. The main dining room is reminiscent of a Mediterranean bistro with a giant oak tree in the middle of the room decked with twinkling lights. Also a perfect choice for romantic endeavors, there is an extensive wine list to select from and an ever-changing menu featuring local ingredients, fresh fish and imported exotic fish. 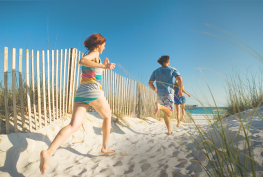 These are just a few of the possibilities for planning your trip in the Open Sands area of Panama City Beach. Pick an attraction or hotel as your starting point and prepare for fun. The West End of Panama City Beach is a quiet stretch of beach with few high rise buildings. Some highlights of the West End include Man in the Sea Museum, Camp Helen State Park, Carousel Supermarket and the Panama City Beach Conservation Park. Anglers try their luck at the Russell-Fields Pier (affectionately known as City Pier), while visitors and residents from throughout the region are lured to the namesake Pier Park area's shops, eateries and entertainment venues. In the Open Sands area you’ll find a mix of residential neighborhoods and beachfront resorts, restaurants, and amusements. 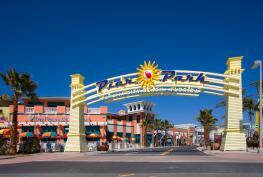 This is indeed the home of classic Panama City Beach offerings, where you’ll find a little bit of everything. 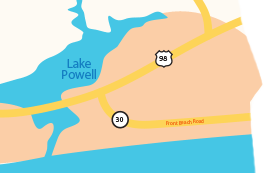 Home of the original “Long Beach,” where families have been coming to relax on the sand since Panama City Beach’s inception, the Middle Beach neighborhood starts on the east where the aptly named Middle Beach Road branches north from Front Beach Road. The area is home to premiere restaurants like Saltwater Grill and Firefly, as well as shopping centers, amusements, and a great stretch of that famous white sand beach. The East End of Panama City Beach houses the Grand Lagoon (the "Gateway to the Gulf"). 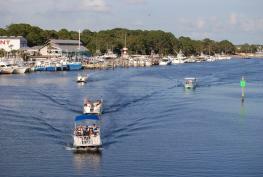 The area is a hub for fishing, boating, sightseeing tours, paddle boarding and other water sports. Most businesses in the area are locally-owned.